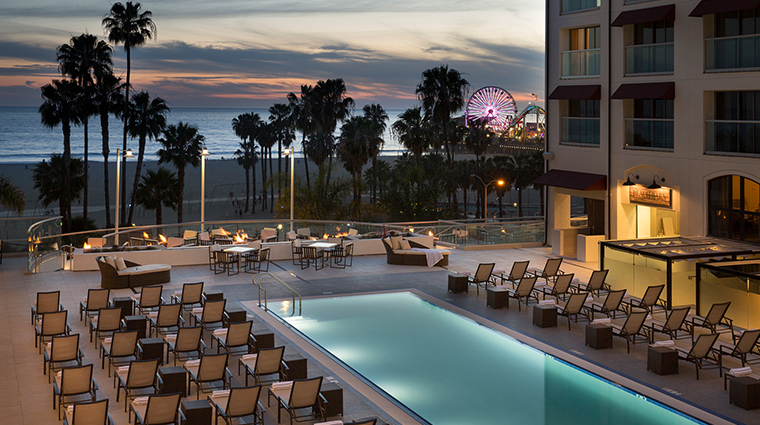 Loews Santa Monica Beach Hotel has been a hallmark of Santa Monica’s Ocean Avenue since it opened in 1989. 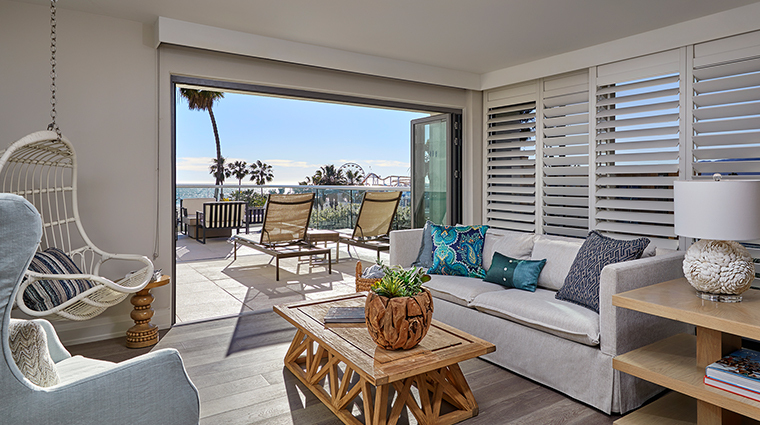 A sprawling city resort on the beach, the hotel is a year-round draw, offering every kind of amenity one would expect from a seaside escape (a waterfront pool), with a quirky SoCal twist (beachside yoga). 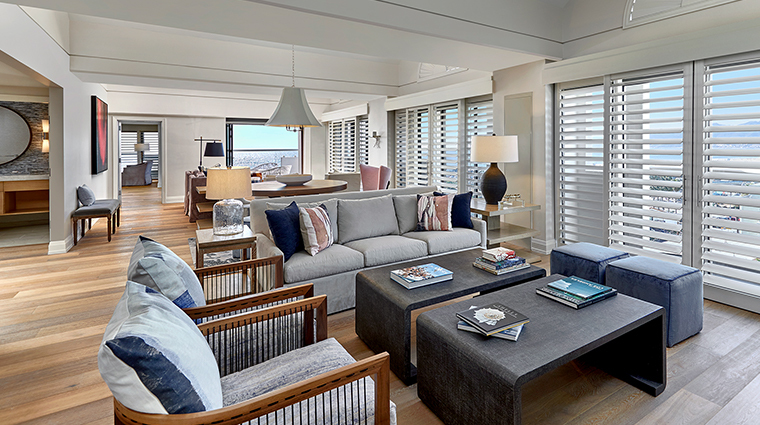 After a recent $4.5 million renovation of the façade, guest rooms were updated with sleek, glass balconies to take advantage of sweeping views of the Pacific and Malibu. 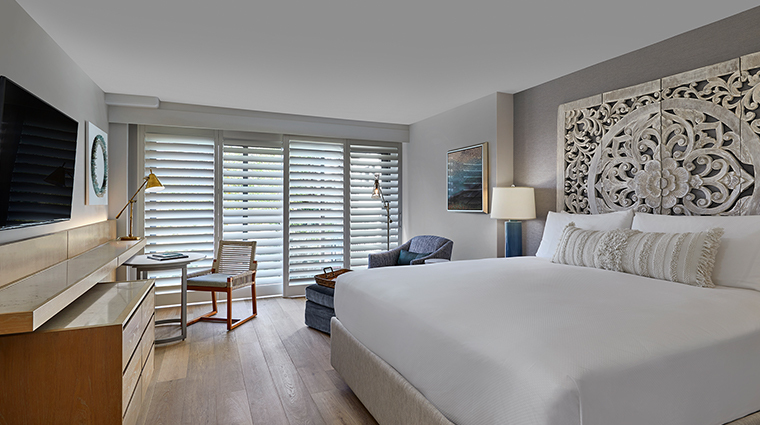 Of the 342 well-appointed, contemporary guest rooms, the suites offer the most generous space and luxurious extras (a Fred Segal library where you can borrow everything from a woven leather purse to cuff links). Besides the beach, many of Santa Monica’s main attractions are within walking distance of the hotel. Whether you want dining hot spots, fitness studios or shopping, many great options are just a stroll away. Just steps away from the shore, Loews Santa Monica Beach Hotel’s central location gives you quick and easy access to Santa Monica’s main attractions, including Santa Monica Pier, Palisades Park, Third Street Promenade and Santa Monica Place on one side and the Pacific Ocean and local fitness paths on the other. 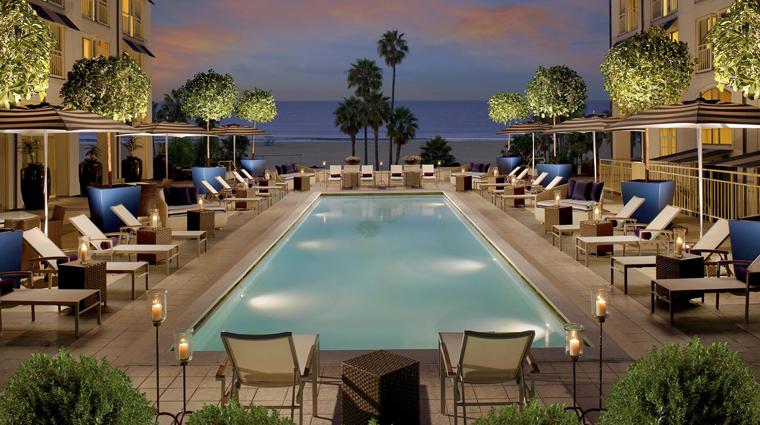 The design style of Loews Santa Monica Beach Hotel centers on the water. Because it sits enviably on the oceanfront, the eight-story building takes care to offer sea views wherever possible. Five dining venues offer up a variety of health-conscious and comfort classics, from the fresh, grilled catch of the day and farmers market produce at Ocean & Vine to craft cocktails and housemade potato chips at Papillion lounge. The hotel is also home to Ocean Spa & Fitness, which offers treatments such as oxygen-infused facials and heated lava shells massages. In keeping with Santa Monica’s reputation for trendy workout programs, the gym offers yoga, Pilates, Hoopnotica hula hooping and spinning. During the high season, the Santa Monica hotel hosts a series of pop-up carts in the lobby that dole out delights such as vintage candies and fresh baked goods. The hotel is entirely unpretentious. It’s always okay to trail in sand and wet bathing suits, or just flop onto a couch and check e-mail. 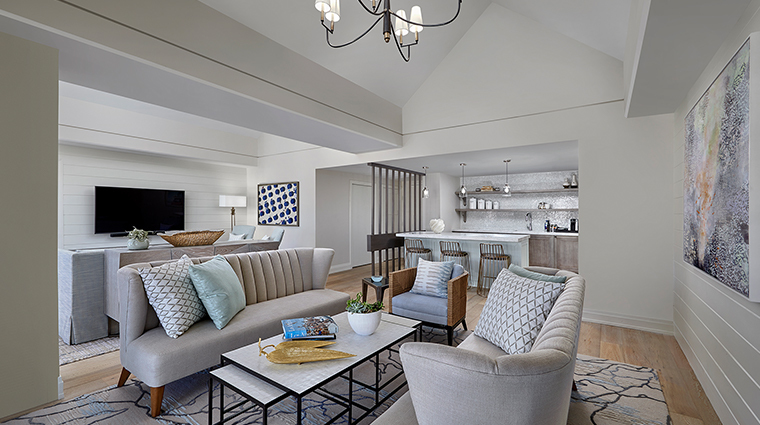 Although July through September are peak months for the throngs of visitors who vacation in Santa Monica each summer, the luxury hotel is always a destination for out-of-town guests and locals. Its Precocious Plates Menus for the Young caters to kids with sophisticated palates who are willing to try adult-oriented dishes, such as lobster risotto. The popular Loews Loves Pets program targets furry members of the family with basics such as bedding and leashes, gourmet room service menus for cats and dogs, as well as walking and sitting services. 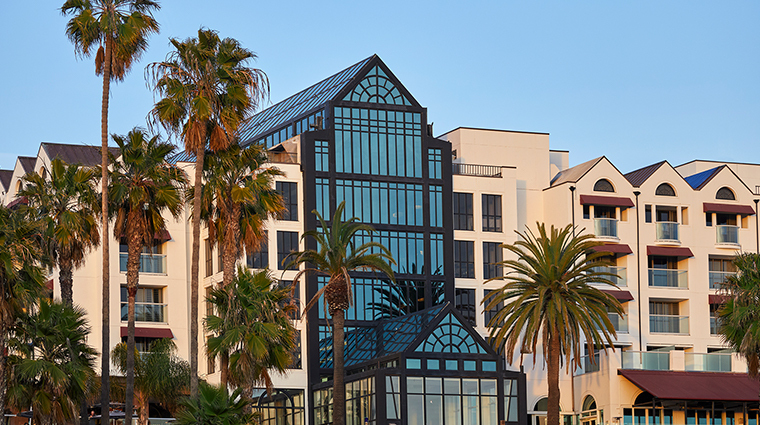 While Loews Santa Monica Beach Hotel brims with activity in its lively pool area and bustling lobby, the city hotel’s 342 guest rooms offer a beachy oasis. 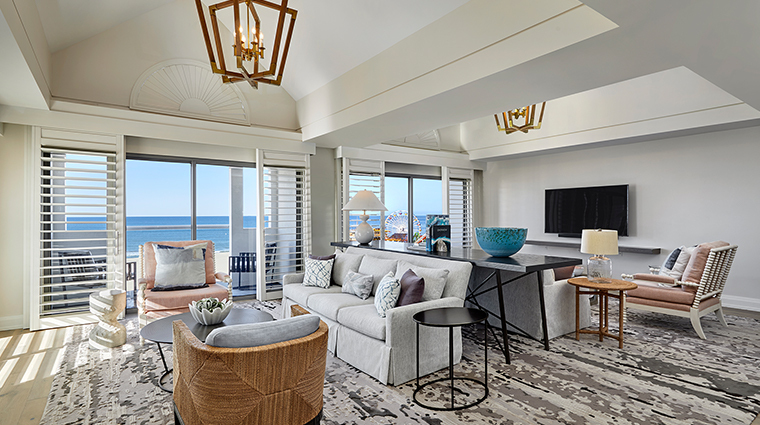 Suite options include 15 one-bedroom suites and four premier suites, including the Palm, Pacifica, Santa Monica and Bay. Comfortable and contemporary, the rooms range from 330 square feet for a Deluxe King or Double to 2,200 square feet for the Palm Suite. 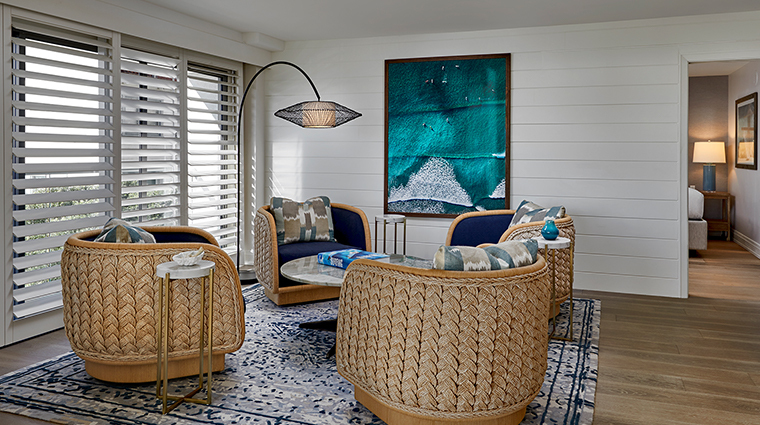 A neutral palette of yellow, sea grass beige and green plays on the idea of the sun, sand and sea, while clean-lined furnishings keep with an urban style. Rooms are outfitted with creature comforts such as Keurig coffee makers, roomy executive desks, video game consoles and bathroom TVs. The Santa Monica hotel recently partnered with L’Occitane en Provence to create the Summer Spa Suite program in which baskets of full-size beauty products are provided for premier suite guests. 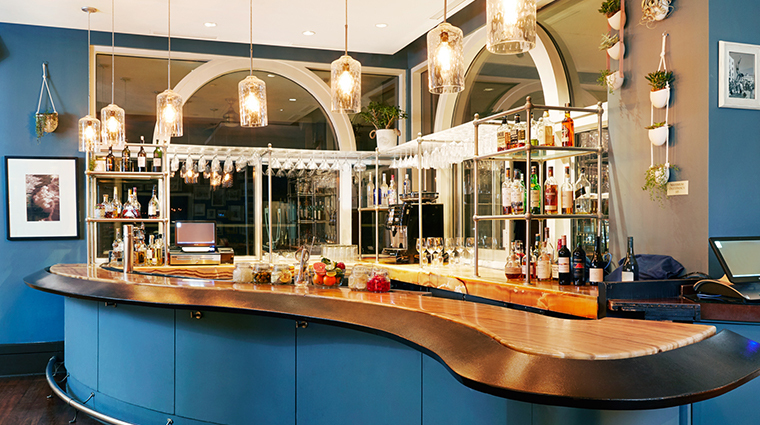 In keeping with Santa Monica’s reputation as a health-conscious city, the chefs here have created a range of dining options that range from fresh local fare sourced at the farmers market to sushi and tapas-style bar bites. Ocean & Vine focuses on fresh produce and grilled, daily caught fish from the California coast. Inside Ocean & Vine, Sushi at Sunset serves up sake and creative rolls inspired by Santa Monica, such as the Farmers Market (beet-infused rice, avocado, cream cheese, sprouts, roasted peppers, cucumber, asparagus and enoki). 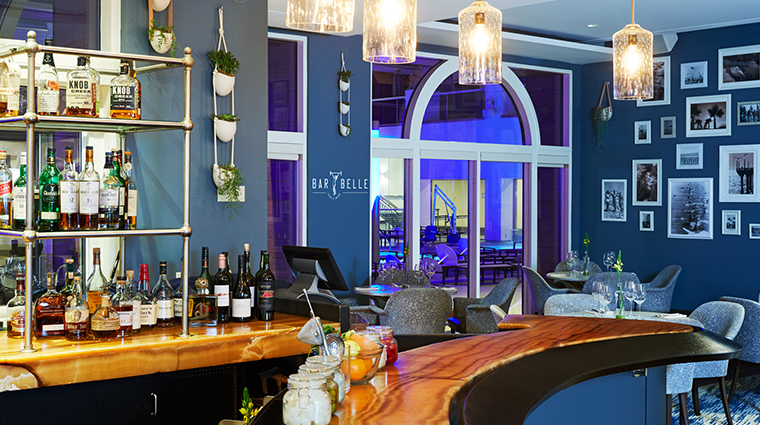 Try Papillion lounge the for breathtaking views of the Pacific, cocktails and a stellar bar menu that includes kale and Napa chips, duck taquitos and fresh ceviche during happy hour. Outside on the pool deck, Blue Streak provides culinary comfort (such as a half-pound burger on brioche with cheese, mushrooms and bacon) for those soaking up rays, lounging in cabanas and snuggling next to fire pits in the evenings. 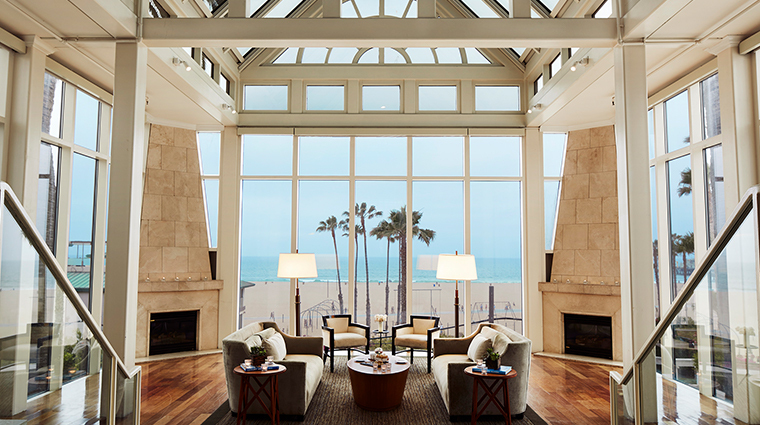 You also can warm up by the fire indoors at the Fireside Lounge, which offers huge glass windows overlooking the beach. Order some wine and snacks like Venice Beach nachos mariscos (nachos topped with shrimp, crab, fried calamari, aged cheddar, roasted peppers, pico de gallo, guacamole and jalapeño cheese sauce).